After my study session wound down earlier tonight, I scanned my bookshelf to find an organizational systems topic that I could write this post on. Organizational culture. Sustainability. Leverage points. They all jumped out, but none of them grabbed me. 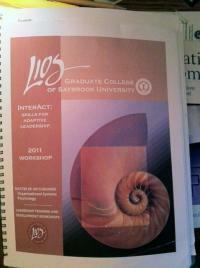 Then my eyes landed on a thin booklet from the Leadership Institute of Seattle (or LIOS)—a booklet I received at Saybrook’s January 2011 residential conference. The 43-page manual—a learning guide from a workshop I attended called “InterAct: Skills for Adaptive Leadership”—had been sitting on my shelf unopened for almost nine months. It was pinned between a book by Peter Block and a large, white envelope with a revised copy of my 2010 Saybrook admissions essay and transcripts. I pulled the booklet off the shelf and flipped through it, immediately assuming I’d find nothing of interest or at least nothing I’d really want to revisit, let alone publicly. That two-day InterAct session, after all, was pretty tough. InterAct was like a group therapy session only there weren’t any psychologists in the room and the group consisted of fellow students who, for the most part, were complete strangers to me. The instructors divided us into two small groups and had us sit in a circle in the center of the room, one group at a time. In the safe space the instructors created, they asked us to consciously react to the assumptions and perceptions each group member in the circle had. Day one went great for me, but day two was brutal. It wouldn’t have been if one minor observation hadn’t opened up a can of emotional worms. When the instructors told my circle to return to our student coaches for guidance, one of my coaches said that I didn’t seem authentic when I empathized with another student in the circle about a similar history we both had concerning a family situation. I didn’t like that piece of criticism. It cut deep. I may not be much, but I do try to be plainly authentic in everything I do so this criticism really hurt. When we returned to our circle after this coaching session, I informed the circle of my coach’s allegation. My coach, who remained outside the circle watching, was floored; her jaw dropped and, in her disbelief, she latched on to another student. She couldn’t chime in and correct me because no one outside the circle could speak while the circle was in its pow-wow. Rather than shut up, which would’ve been a wise move, I began to open up about the allegation within the circle and what it meant to me. Next thing I knew, I was spiraling into the depths of public vulnerability at breakneck speeds and I was severely uncomfortable. This discomfort did little to stop me on this white-knuckle ride, and I’m not one to give up or quit, so I kept going. I kept on talking. I fought back tears—because that’s what I do when these feelings surface, I fight them—as I worked passed my coach’s allegation and addressed the family situation, which was the nerve her allegation had sorely pinched. A faculty member in our circle encouraged me to take ownership of these feelings as other members of the group felt the rush of empathy affect them as well. Some cried. Others squirmed. Everybody felt the emotions and we experienced a collective meltdown. I don’t think the instructors were fully prepared for the chaos that unravelled in that conference room in Millbrae, California, that cool winter day, but they encouraged us to continue before guiding the conversation back to a safe, constructive place. InterAct was an exercise in unadulterated vulnerability—something I’m not really keen on. I’m more like wholeness and vulnerability researcher Brené Brown on these matters. So there I was a little while ago, sitting at the edge of my bed thumbing through the LIOS booklet remembering an exercise in vulnerability that really pushed me far beyond my comfort zone. This, just hours after I’d talked myself into toughening up and putting my MBA game-face on once again so I can force myself back into the cold, callous, and competitive, power-networking circles that I used to frequent—before Saybrook—in an effort to find a job. As I began to type this sentence, the past year flashed before my eyes much the same way my InterAct experience poured forth in this post. Looking back, the past year was filled with moments where I’ve had to face myself on this same, very raw level in order to address assumptions, perceptions, and beliefs that I’d held on to tightly for many years. I remembered something else Brown said about her struggle in dealing with vulnerability during her TED talk. It’s funny. The same thing seems to be happening to me.